A photo of a rusted shovel with a broken handle, aged by years of harsh Appalachian weather and hard work, sat on display in UNC Charlotte’s Atkins Library during most of November. Seth Flynn, the creator, is a senior who is minoring in gerontology; he submitted it as part of a contest hosted by the Gerontology Program, with the support of the Gerontology Club and the J. Murrey Atkins Library, which asked students to answer the question: “How do you see aging?” The work and the touching story behind it earned Flynn first place in the competition. Flynn drew inspiration for the piece from his relationship with his grandmother and the time they spent together in her garden during his childhood. His poem references the nurturing, traditions, values and healing that take root in her garden. Contestants in the competition submitted original artwork and a short description of their pieces, detailing how they captured their perception of aging. Many students depicted age through photos of the strength, serenity and peace of nature; the life cycle of flowers; and the images of loved ones such as contrasting hands, faces depicting strength and resilience and a multigenerational family. Flynn said his grandmother, who never completed her education, has been his main support system and the person that has pushed him to go every step of the way in his education and career. He expects to graduate in May 2018 with majors in biology and chemistry and minors in sociology and gerontology. Flynn plans to attend medical school next fall, where he will specialize in geriatrics. “The Gerontology Program tries to create this image of aging, that this is successful aging. We draw from many disciplines, and we bring them together to educate our students on how to address the issues of the person who is aging. 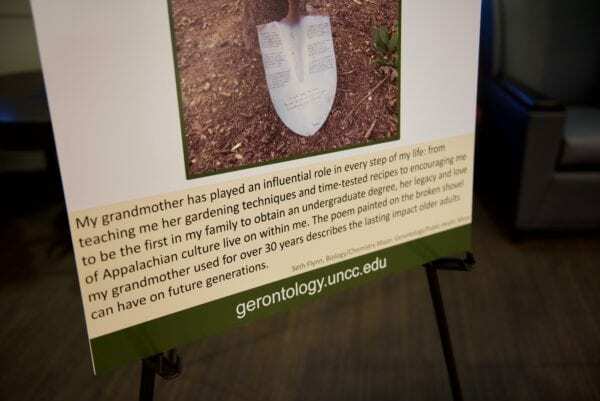 The competition has helped to extend the thought of diversity within the prospect of aging,” said Julian Montero-Rodriguez, director of the UNC Charlotte Gerontology Program. 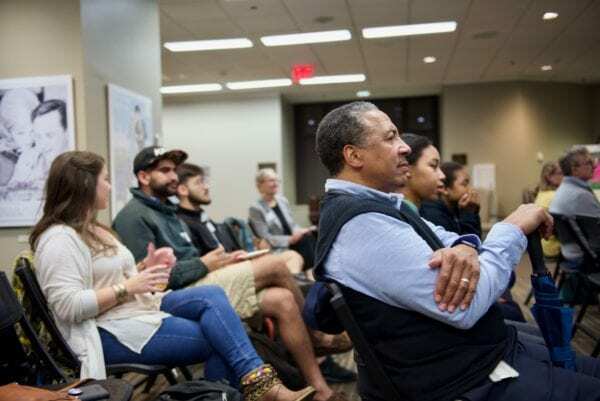 The Gerontology Program hosted a celebration of the students’ art in early November, with attendees coming from campus and the broader community. 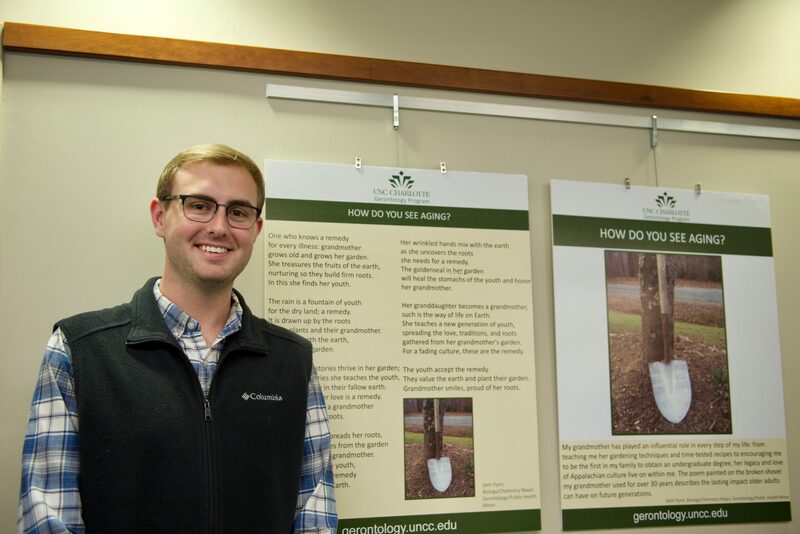 Flynn’s artwork, along with the others submitted in the contest, went on display on the first floor of the College of Health and Human Services Building in late November and will be displayed throughout campus and in the community in coming months. In addition to Flynn, other contest winners were Nidia Bermudez, first runner up; Amanda Kuykendall; second runner up; and Bethany Hyder, third runner up. April Crumpler, Alexandra Glass and Anastasia Schmidt received merit awards.